Notes on a Case of Leucocythaemia is a letter written by Arthur Conan Doyle first published in The Lancet on 25 march 1882. 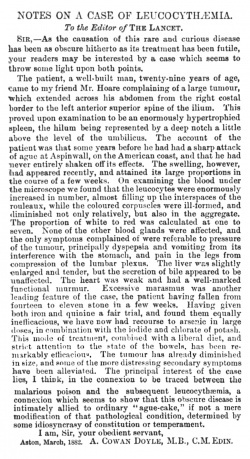 Sir, — As the causation of this rare and curious disease has been as obscure hitherto as its treatment has been futile, your readers may be interested by a case which seems lo throw some light upon both points. The patient, a well-built man, twenty-nine years of age, came to my friend Mr. Hoare complaining of a large tumour, which extended across his abdomen from the right costal border to the left anterior superior spine of the ilium. This proved upon examination to be an enormously hypertrophied spleen, the hilum being represented by a deep notch a little above the level of the umbilicus. The account of the patient was that some years before he had had a sharp attack of ague at Aspinwall, on the American coast, and that he had never entirely shaken off its effects. The swelling, however, had appeared recently, and attained its large proportions in the course of a few weeks. On examining the blood under the microscope we found that the leucocytes were enormously increased in number, almost filling up the interspaces of the rouleaux, while the coloured corpuscles were ill-formed, and diminished not only relatively, but also in the aggregate. The proportion of white to red was calculated atone to seven. None of the other blood glands were affected, and the only symptoms complained of were referable to pressure of the tumour, principally dyspepsia and vomiting from its interference with the stomach, and pain in the legs from compression of the lumbar plexus. The liver was slightly enlarged and tender, but the secretion of bile appeared to be unaffected. The heart was weak and had a well-marked functional murmur. Excessive marasmus was another leading feature of the case, the patient having fallen from fourteen to eleven stone in a few weeks. Having given both iron and quinine a fair trial, and found them equally inefficacious, we have now had recourse to arsenic in large doses, in combination with the iodide and chlorate of potash. This mode of treatment, combined with a liberal diet, and strict attention to the state of the bowels, has been remarkably efficacious. The tumour has already diminished in size, and some of the more distressing secondary symptoms have been alleviated. The principal interest of the case lies, I think, in the connexion to be traced between the malarious poison and the subsequent leucocythaemia, a connexion which seems to show that this obscure disease is intimately allied to ordinary "ague-cake," if not a mere modification of that pathological condition, determined by some idiosyncracy of constitution or temperament. A. CONAN DOYLE, M.B., C.M. EDIN. This page was last edited on 21 September 2018, at 18:14.